Here’s this beautiful Thindlu Main Road in north Bangalore with a humungous GKVK campus on the one side and Vidyaranyapura with well-built houses on the other. The median is filled with multi-coloured bougainvillea. Beautifully flowering trees line both sides of the road. Pavements are well in place. No potholes. A smooth drive as it doesn’t get crowded even during peak hours. 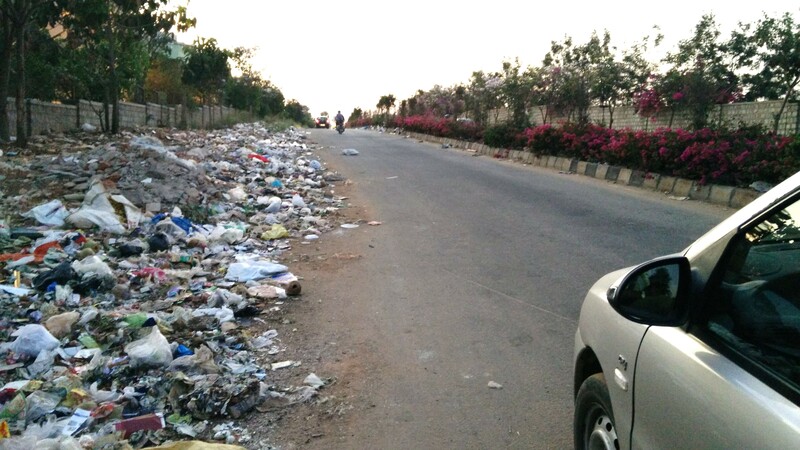 But each time I drive through this road, it hurts to see the huge amount of garbage thrown on the entire stretch. At every interval of 10 metres or so, you find plastic and other mixed waste reduced to ashes or heaps on fire spewing out thick smoke. A horrible stench that is peculiar to burning plastic stinks up the entire stretch. Paradoxically, none of this seems to bother the people living in the houses on the Vidyaranyapura side. It’s right within their sight and in fact, all this tragedy is happening right under their nose, outside of their windows and balconies. What is it that makes us so impossibly immune to all such horrible tragedies? Baffling! Please do not assume that these areas are stuck in the same “pourakarmikas-casually-mix-up-our-segregated-waste” conundrum. On October 15 last, a massive training session of the PKs was held in Yelahanka BBMP office with senior SWM activist N S Ramakanth at the helm. Along with ITC, we drew a sustainable plan of empowering PKs by letting them collect and sell dry waste at pretty decent rates at the dry waste collection centre (DWCC) located on Major Unnikrishnan Road. A few follow-up sessions later, bags to store dry waste were distributed by ITC to each house in many localities. N S Ramakanth, SWMRT, discusses dry waste collection methods with PKs at a training session held in Yelahanka last October. The ITC staff prepares to distribute dry waste collection bags to each house in Yelahanka, Ward 2. The best part of the story: I saw people bringing these bags to the vegetable market. When I grilled them as to what they did with their dry waste, they just shrugged their shoulders, mumbled something and moved on. What is it that prevents people from keeping aside recyclable dry waste for a week or so? It does not stink if kept clean. Ironically, hurdles apart, Yelahanka is still scoring the best with dry waste collection running into at least 1-1.5 tonnes per day. Imagine how much more recyclables could be saved if these initiatives had people’s participation? This entry was posted in Endlessly Green and tagged garage burning, GKVK Campus, N S Ramakanth, North Bangalore, SWM, Thindlu Main Road, Yelahanka DWCC. Bookmark the permalink.